Hi again! So Episode 6 of My Unfortunate Boyfriend. Ready for the recap? Yes continue on. No, skip to the bottom for comments and stay tuned Thursday for the newest Drama Club posting. We left off with Ji Na spread across the meeting room floor. She didn't even attempt to explain she just apologized, which really surprised me. Hee Cheul finds out that "Mr. Seed" wanted to go with Ji Na's idea instead so Hee Cheul forms two teams. The second one with Mr. Seed and Ji Na and whoever else wants to join. Oddball guy joins their team, Team B, because he thinks it'll be easier. Ji Na finds out Hee Cheul did this because he wants to get Mr. Seed fired and thinks they'll be incompetent, but Ji Na isn't one to take defeat lying down and she is determined to win. She takes Oddball to Tae Woon's where he realizes Mr. seed and Mr. Unfortunate are the same person. They might have a chance at winning if Oddball would join in and help, he is a genius after all, but while Ji Na is trying to coax him the police come in and arrest him. We find out that Oddball has been harassing an actress online for the last 5 years and is being arrested for slander. Tae Woon suggests they write apology comments under every mean comment Oddball wrote and they stay up all night apologizing. In the morning the police release Oddball who is so grateful that he hugs Tae Woon and now is completely cooperative. They come up with a plan for their nature-themed park to feature a rock garden since there are so many rocks at the location. When Ji Na finds out there's a rock garden nearby she has Tae Woon take her. On their way Tae Woon's weirdo friend and the strange neighbor girl see and invite themselves along. 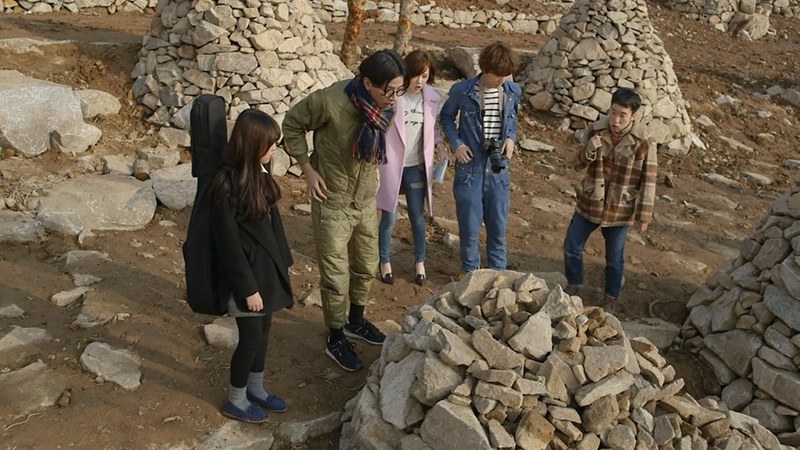 So our odd but strangely adorable gang of five go to this rock garden where Tae Woon explains that people moved the rocks by hand and each one was placed as someone's wish. It's quite a beautiful story, really. They're looking around when Tae Woon's friend accidentially knocks down one of the towers. Everyone else wants to leave before they get caught, but Tae Woon won't because they're people's wishes and the tower needs to be rebuilt. He tells everyone he'll catch up with them, but they all agree to stay back and help rebuild the tower. They work all night long and eventually have to stay overnight at a small inn nearby. Tae Woon's friend makes the diagnosis for Tae Woon that he's in love with Ji Na and for some reason Tae Woon finds this shocking. Maybe because he's never been in love. 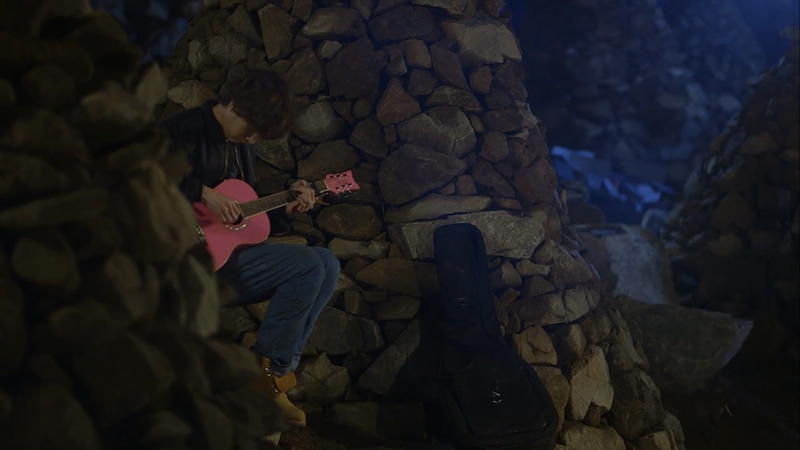 Later Ji Na goes out to stretch in the middle of the night and finds Tae Woon finishing up the tower by himself and then he breaks out the guitar. Game over. You can tell that Ji Na is growing fond of him and his innocent nature. The next day Ji Na goes to work and is finishing up their presentation. Tae Woon sends her the pictures of her from the day before that turned out not so flattering, thinking for some reason that this would cheer her up. It's a Sunday and she thinks no one will be in the office so she breaks the office rule and brings in food. However, Hee Cheul has also come into the office. He told Hye Mi he couldn't meet up for lunch because he had to work. 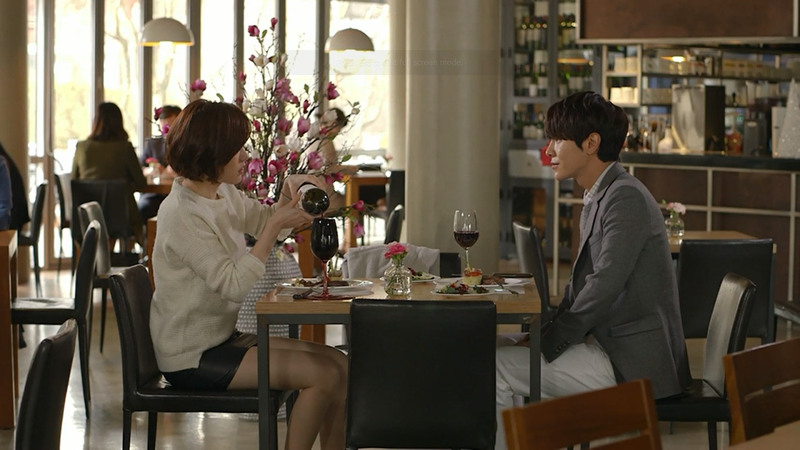 Hee Cheul catches Ji Na with the food and reprimands her quite sternly, but then invites her out to lunch. That was weird. Meanwhile, Hye Mi spies the two of them leaving together and being a little flirty. She thinks Hee Cheul lied about working and is insanely jealous of Ji Na. We see her going into the office where Ji Na's usb drive is sitting and we know this isn't going to end well. So Ji Na and Hee Cheul are at lunch and the conversation lands on the topic of love and how they both like love, but find dating silly. Still, they think it's nice to have love. Hee Cheul asks Ji Na if she has someone to love and she says she has to find someone. He asks, what about him? Ji Na is so shocked that she spills her wine, but never gives him an answer. After they part she freaks out majorly because she's so excited that he would suggest that. -I was not happy with Hee Cheul glaring at Ji Na in the conference room. Overall he's not being very nice to her and it's making it hard for me to keep a positive opinion of him. -So finally Ji Na realizes she didn't know Tae Woon's real name. I was wondering if it was just supposed to be implied knowledge. lol. -Oddball wasn't even trying to defend himself in jail. Ji Na was doing it all for him, which was pretty cute to be honest. -My heart melted when Tae Woon thanked Ji Na for apologizing to him with that cute smile. -Tae Woon is so good at taking care of Ji Na. -When Oddball gets released and hugs Tae Woon is absolutely adorable! -Why do all these tenured advertisers trust a newbie like Hye Mi to do all the work without supervision? Doesn't seem smart. -Ji Na, Tae Woon, and Oddball are the quirkiest, but best team ever. -What kind of mom lets her daughter hang around two weird adult males constantly- one an obvious perv? -It's funny how the men are getting all emotional with the stones and Ji Na is the one to tell them to stop being so emotional. -Really, Hee Cheul? Really? You're seriously going to...ugh, I can't even tell if you like her or not? One minute you're mean and the next you're flirting?!? -Hye Mi needs to grow up. You're never going to win a man like that, honey.